It took me a little over a year, but I finally feel that I’ve lived up to my domain name and twitter handle. This whole blog started as a hobby, something that I could pursue in my free time, something to encourage me to develop creative skills, something to get me writing and drawing on a regular basis. When I bought the domain thegraphicrecorder.com and started this website, I didn’t even have a clear idea about what that term meant. Now, I am one. A few weeks ago I had my first official, paid graphic recording gig. And it went great. I enjoyed the experience much more than I thought I would, and the folks that I was working for were happy with what I produced. And, more importantly, I was happy with what I produced. It helped that the topic that I was recording was dear to my heart. 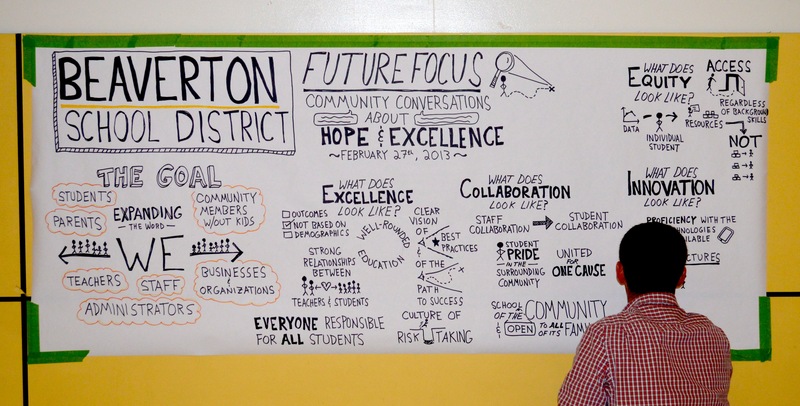 I recorded one of the Community Conversations that are part of the Beaverton School District’s Future Focus initiative, in which they are working with the broader community to create a vision for where the district needs to go. I am so passionate about education that sometimes I have to walk away from it just to breathe. I haven’t yet figured out my role in the education system, but I feel fortunate that my first graphic recorder gig was working with a school district to help them define their vision. Sometimes I feel silly for having picked the domain name that I did. Who am I to call myself ‘THE graphic recorder’? Granted, half of the reason that I started this site was the simple fact that the domain name was available. But sometimes I wish I would have just bought dougneill.com and used that from the start. But other times, I think that having this domain name and twitter handle (@TheGraphicRcrdr) has kept me moving forward. I have often felt the need to live up to the name, and that feeling has pushed me through times of struggle. Now that I have successfully completed a graphic recording gig, I feel that I have summited a hill. Not the last hill on my journey, but a reason to celebrate nonetheless. So I’m finally comfortable calling myself a graphic recorder. I don’t like to think of myself as the graphic recorder, but I am a graphic recorder who is excited about improving his craft and owning it. Finally.